Tomorrow is the very first day of My Favorite Things, my Block of the Month (BOM) to be hosted right here on Sewhooked! My Favorite Things includes 12 brand new patterns to paper piece in both 6″ and 12″, as well as a number of bonus blocks to mix and match your own favorites! These patterns are MY Favorite Things, but I hope you will find some of your favorites along the way, too! On the first day of each month, you can download that month’s pattern for free from 8am CST on the 1st to 8am CST on the 2nd. After the first day, each pattern will be available for a $2 from my Craftsy Pattern Shop. The the entire block set will available for sale by December. Background Fabric for 6” blocks only = 1 ¼ yards. Small amounts of other fabrics needed to complete each block. Suggested sashing/border amounts will be shared with final (optional!) layouts in December. NEED PAPER PIECING HELP? I have a page for that! Every pattern for this BOM has been tested by both myself and Amber Lowery, friend and awesomesauce pattern tester! 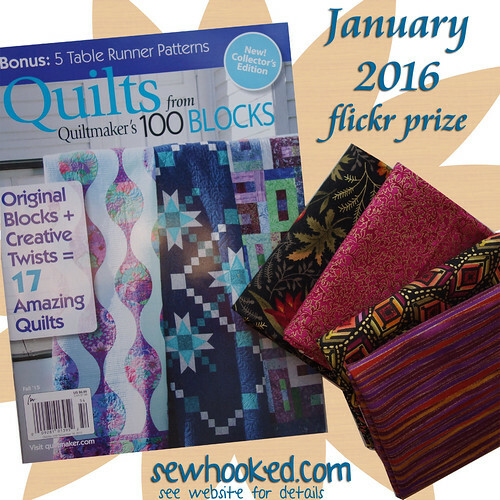 Want a chance to win a fun, free prize each month during 2016? It’s easy! Make today’s pattern (or any pattern designed by me) and share it with my flickr group. You’ll be entered to win for each photo you share! Winners to be announced on the first Friday of each month. See you tomorrow for the FREE January pattern! This entry was posted in My Favorite Things BOM and tagged 2016, block of the month, bom, bom 2016, favthingsBOM, my favorite things, paper pieced, paper piecing on December 31, 2015 by Jennifer Ofenstein. Oh dear, I had to do a time conversion from CST to AEST. Appears we are sixteen hiurs ahead of you. I also have to factor in my shift work to this time as well, better get busy adding hours. In my estimarion 8.00am CST is equal to roughly midnight of that day over here. I know this block is supposed to be free until 2/2/16 but when I click on it, it says it’s $2.00. Am I doing something wrong? Each month’s block is available for free download on the first day of the month and for $2 on Craftsy thereafter. I am sorry for any confusion.